...many years ago when we lived in Kirkland, Washington I had just moved here from Hawaii a few short years before and when I was a little boy in Hawaii I was always mesmerized by pumpkin carving and in Kirkland I met a gentleman who had a little boning knife and he used to carve the most unique pumpkins that I had ever seen in my life. And I just had to learn how to carve those pumpkins the way he carved the pumpkins. So I practiced and I practiced and I practiced. And then I acquired a pumpkin carving knife of my own that somebody had given me ironically enough, to clean fish. And it was that butcher shop that was up in Edmonds. Anyway, that's another story. . But, being from Hawaii and being part Oriental and now having migrated into Washington State and learned some of the art and some of the significant to some people insignificant to others, different forms of Northwest ovoid art. I think that's what they call it. And I've incorporated what I think in my mind and what I've grown up with and observed into different pumpkin patterns for you to take advantage of and be able to carve pumpkins to your hearts desire. Fall is such a wonderful time of year. It is the beginning of the seasons, for me anyway. It is the end of summer, harvest time. And what better way to do it than to carve a pumpkin and probably the warmest light in the whole world, at that time anyway is to look at a candle glowing with that orange yellowish pumpkinish flavor to it. The flavor comes from the smell that the heat from the candle causes. If you put a little pumpkin spice on the lid of the pumpkin you can in fact have that smell perpetuate your whole house. You know when children are trick-or-treating in your neighborhood and the smell of wax and pumpkins some of them burning emanates throughout the whole neighborhood. This web site is for the person who loves to carve pumpkins. What you'll find here is not only the designs from very, very simple to very intricate, but, also the tools that you can manufacture yourself. But there are many, many user imagination type tools that you yourself can either acquire through places like Ben Franklin stores. Here in Redmond, Ben Franklin Craft or any of their stores throughout the United States. The tools that I'm going to suggest you make can be given to your children but you must always use discretion as a parent. I will show you how to make a pumpkin carving knife as well as a pumpkin-carving saw. 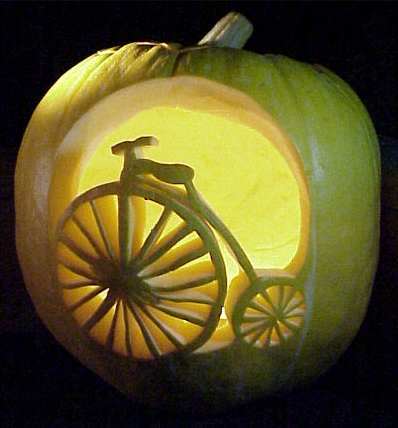 Also on my web page you will be able to make tools that you can carve a giant pumpkin with. I have seen people carve giant pumpkins, and they are not as soft as you might think, but they can be carved on pretty readily by using one of my tool designs. You'll be able to get the job done. So after developing, brainstorming, and talking to my friends there's another aspect of my pumpkin-carving world: It is how to preserve a pumpkin that you have carved, like a small little sugar pumpkin. You'll be able to learn how to preserve that pumpkin if you follow the instruction on the inside of the web page.